Escape during one day and navigate on the Seine River to discover Impressionists and “Guinguettes”. Embark on the island of Cité, in the heart of the capital, next to “Pont Neuf”, the oldest bridge of Paris and then cross the City of Lights. Our guide will tell you about the History of the most famous monuments and the most prestigious bridges of the ancient Lutèce. The boat peacefully goes down the Seine River, toward the West of Paris. Once you greeted the statue of Liberty and passed the Parc André Citroën, the boat leaves Paris and arrives in Hauts de Seine. 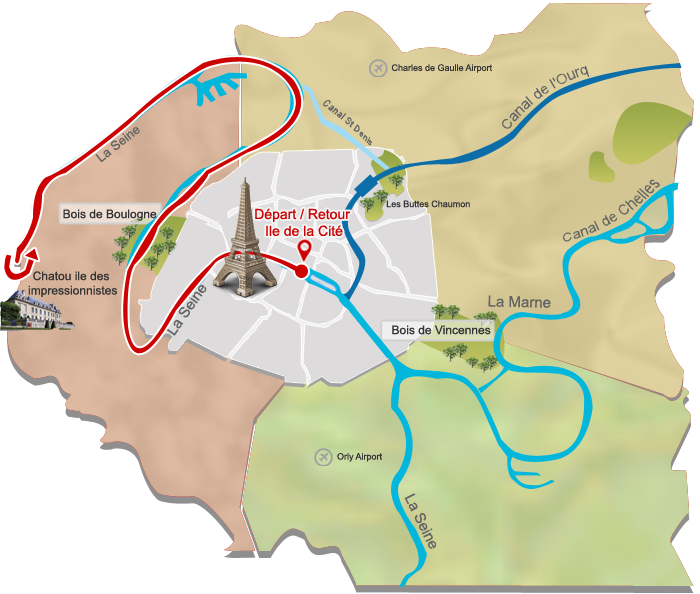 You will arrive in Seine-Saint-Denis, get around the Saint-Denis island that was, in the XIXth century, a leisure place for Parisians who enjoyed their Sunday with bathing and guinguettes. Continue to go down the river toward the Marina of Gennevilliers, the second European fluvial marina, and then toward the plains of Argenteuil that were an industrial and a wine-making place. Besides, the pillars of the Eiffel Tower were made there. This part of the Seine River was often painted by Gustave Caillebotte who was also a naval architector. You will stop near the restaurant “Fournaise”, which was a place very much appreciated by artists of the XIXth century, such as Manet, Maupassant and of course Renoir who immortalized this place with the famous painting: “Déjeuner des canotiers”.